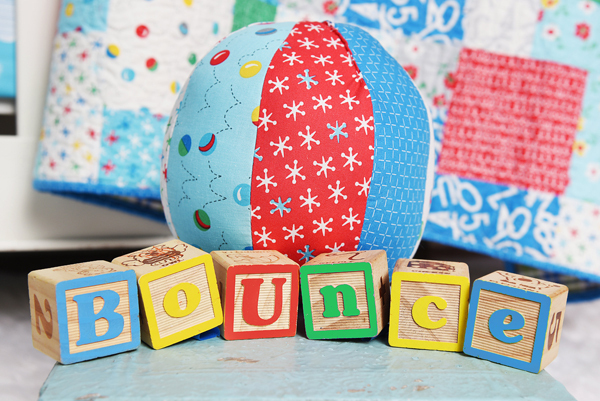 I finally get to share Bounce with you today! This is my 6th (!) fabric collection with Windham Fabrics. I actually sketched out the art for this line way back in 2012, but the timing just never worked to release it. After my last fabric line I took a longer and much needed break from designing, and afterwards it just felt right to try something different and new! 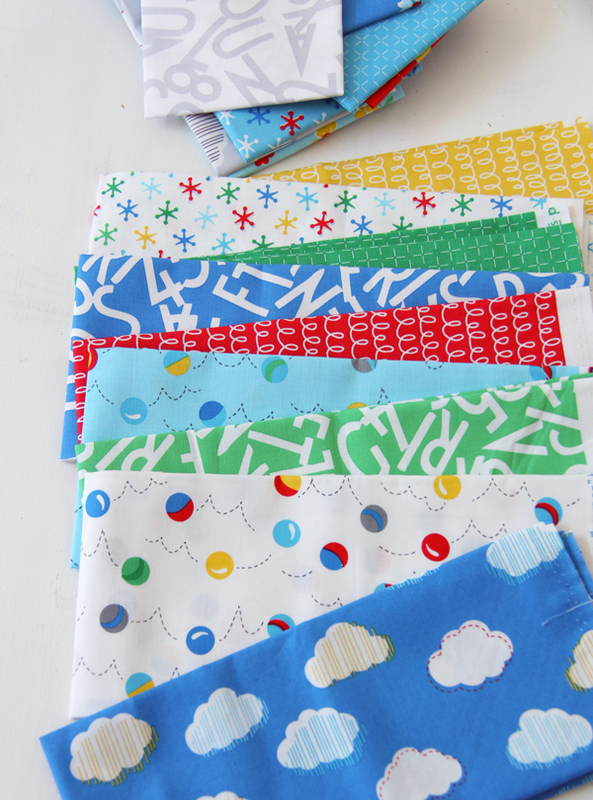 I’m always sewing and quilting for kids, so it was so fun to actually design a fabric line more geared to them. When we lived in Ohio I found a vintage Jacks game at a swap meet. The packaging was pretty beat up, but it was adorable with faded primary colors, big block letters, with a red and blue striped bouncy ball inside. I bought the set for the ball inside, but forgot about it until a couple of years later when we moved again and I found it in a box of random junk. I kept the ball, threw away the packaging and jacks, then wouldn’t you know it….later that year it was the inspiration for this line (and I was kicking myself for throwing away that package!). I wanted this line to feel playful and light, but still in my favorite colors that blend seamlessly with my other collections. 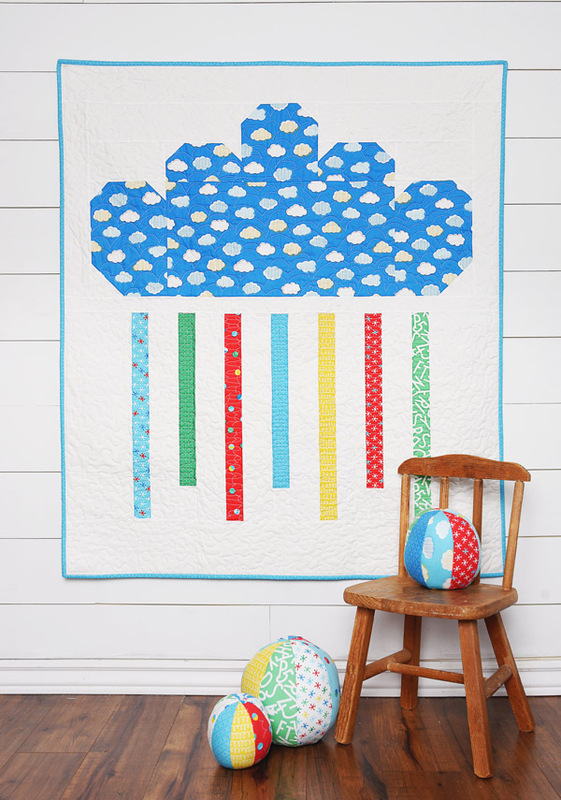 There are bouncy balls, jacks, clouds, a few flowers, and my favorite block letter print. Even though I designed this line with kids in mind, it still has some great colors and prints that work for everyone. Rainy Day Jr. pattern by Pen+Paper Patterns found here. Free fabric beach balls pattern found here. Off Track jelly roll pattern found here. 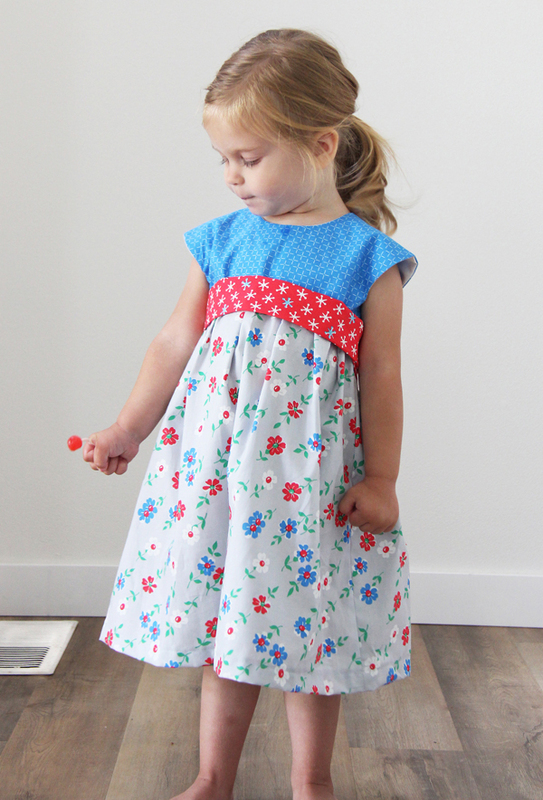 Geranium Dress Pattern by Made By Rae found here. The sucker was bribery. Ziggy Baby pattern found here. 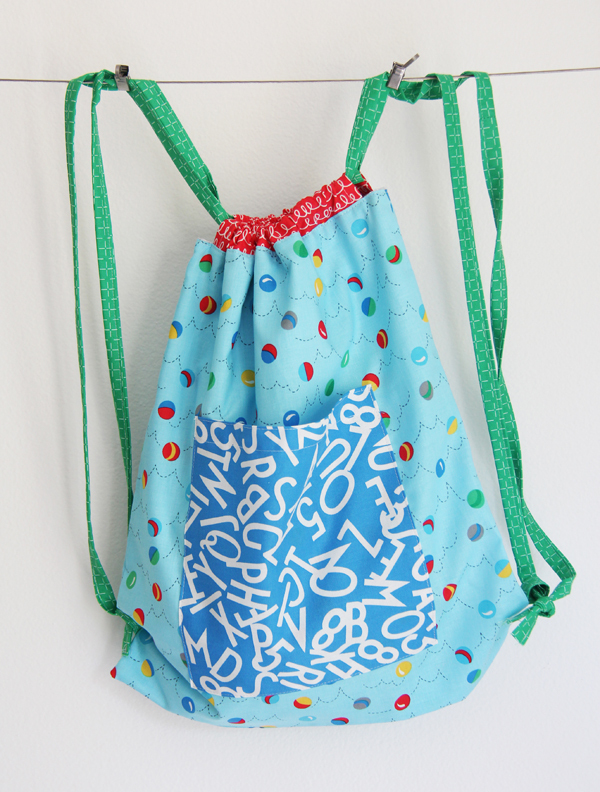 Drawstring Backpack tutorial by Sew Can She found here. Libby Quilt Pattern by Kitchen Table Quilting found here. Many of the photos were taken by Brianne Serrano Photography. All of these projects and quilts were made with the help of caffeine, pizza for dinner on repeat, my Mom babysitting, no clean laundry, and me not sleeping for a week. For reals. 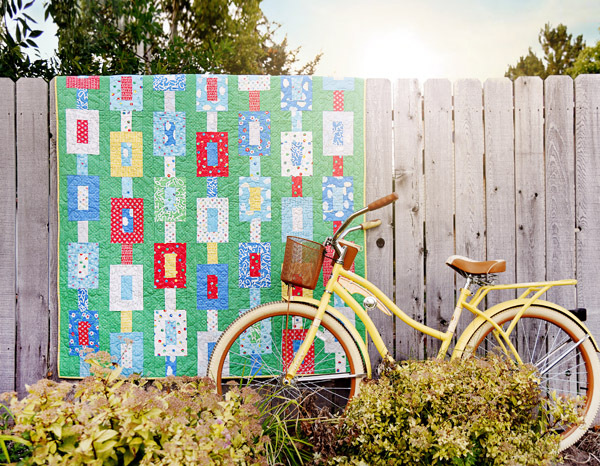 Bounce is on sale to quilt shops now through Windham Fabrics. It comes out to stores in March 2019 (it will be here before we know it!). You can see my whole Look book for this collection HERE, and I’ll share more of my other projects next week in another post so I don’t put you to sleep reading this one. As always, thank you for your support, kindness, and encouragement. I wouldn’t be able to do anything I do without this wonderful community! Love your new line. There is something about bright colors and white that pulls me in. Can’t wait to see it in the shops. I have made those beach balls, the grandkids and papa love them. Thank you! I have made tons of those balls…they are the best! Oh my! 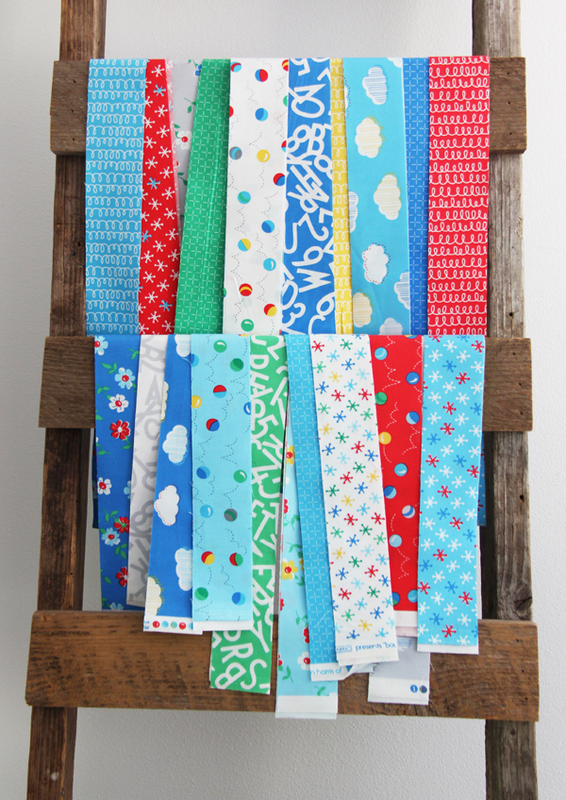 What a fun collection of fabrics! Absolutely love the bright colors and designs. The samples are great for kick starting the inspiration and imagination. Thanks, Allison! Sekina, you took the words right out of my mind! 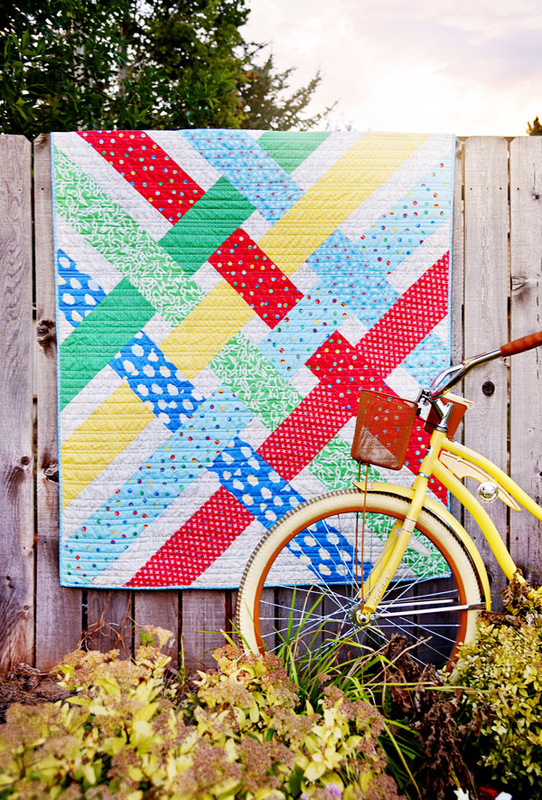 The fabric is delightful and the quilts truly highlight them. I cannot wait to use them for children’s quilts. Having no babies in our family anymore, I keep turning out baby and children’s quilts ‘just in case’ someone I know will have a baby or a child needing cozy quilt comfort while recovering from an illness, and to donate to the local pediatric ward of my local hospital. There is never an end to need. Congrats, Allison! I love the color palette and loops prints! You know how it goes…no rest for the weary! ;) Or something like that! This is a very charming line!! Congratulations!! 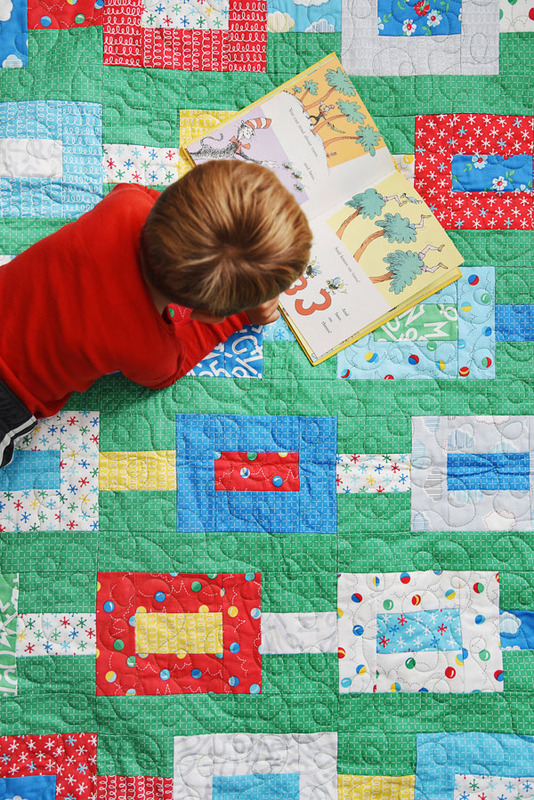 And indeed the quilts and projects to be made with it will warm up the heart of any child! Wow, what a great collection! I just loved scrolling through all those creations made with your fabrics. Fantastic!!! First off—LOVE that blue! This is darling. Such a great line for gender neutral baby quilts; so many of the young mamas I know are waiting until birth to find out the gender. Can’t wait to see this in person. Yay that was my goal! Gender neutral and still fun and not all yellow! ;) Thanks! I love this new collection of fabrics. Now that I am a gramma, this is fabric I must have!! I know…it’s so mean to make us wait! Thank you! Absolutely love your new line! 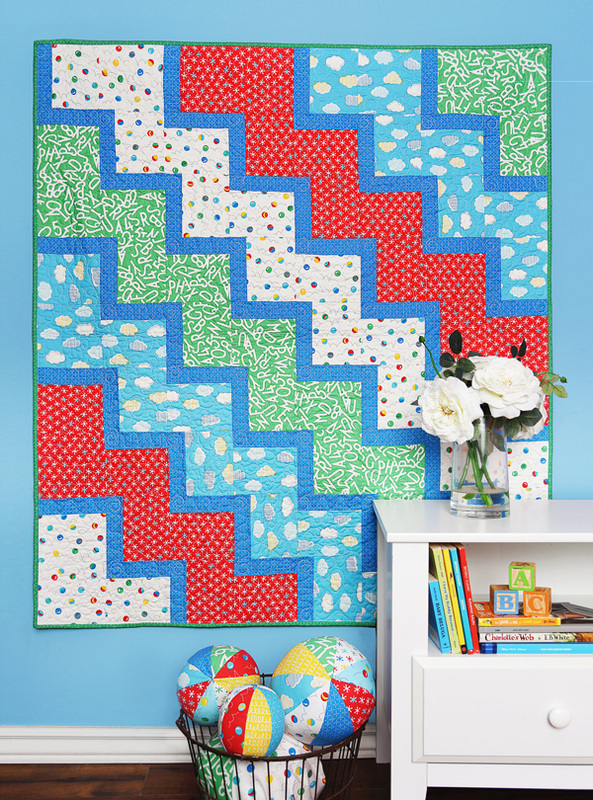 So bright and cheerful – and perfect for the quilts I love to sew. Such beautiful, beautiful prints. Hi Allison, congratulations on your new collection! It is so fun, colourful and playful. I absolutely love your fabrics and style, with clear, fresh bright colours – and I especially love that this kid-friendly fabric is great for boys AND girls. There are so many pretty and girly fabrics, but never that many non-babyish fabrics to choose from for boys. Thank you, thank you, thank you!!! Thank YOU Kelly for the kind comment!! A beautiful line! 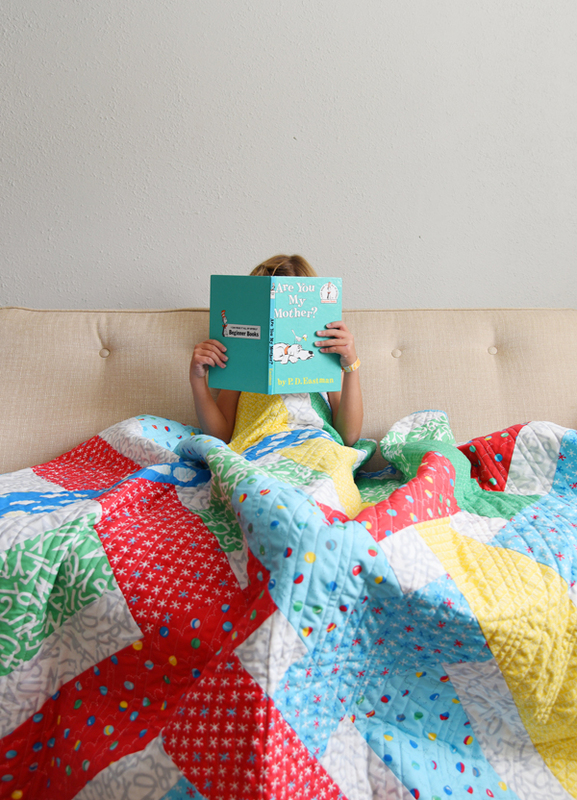 The colors & prints are what any child would adore in a quilt. Congratulations! The quilts & balls look great. Love it. Can’t wait to get may hands on it. Another gorgeous line of fabric. Well done! But the last thing you mention actually means there was a lot of stress behind all those cheerful bright projects…why does it have to be like that…? But if so, then it cannot be stressful. something just doesn’t add up here. but where is quality in that? Fabric companies order “pre-yardage” of their new lines coming out to preview at Quilt Market (a wholesale show twice a year). So usually by the time we get fabric from overseas…there is a week or two to make everything, photograph everything, and get photos to the company so they can sell it! Mostly it’s just the shipping takes so long, it leaves very little time to actually sew. Luckily I only have to sew crazy like this for a week or so every year…other than that sewing is very enjoyable and mindless! This is my last crazy sewing session for another year or so, back to all non stress. :) Sewing should be fun, but if you are working and it’s your job…there are always moments of stress! What great colors! 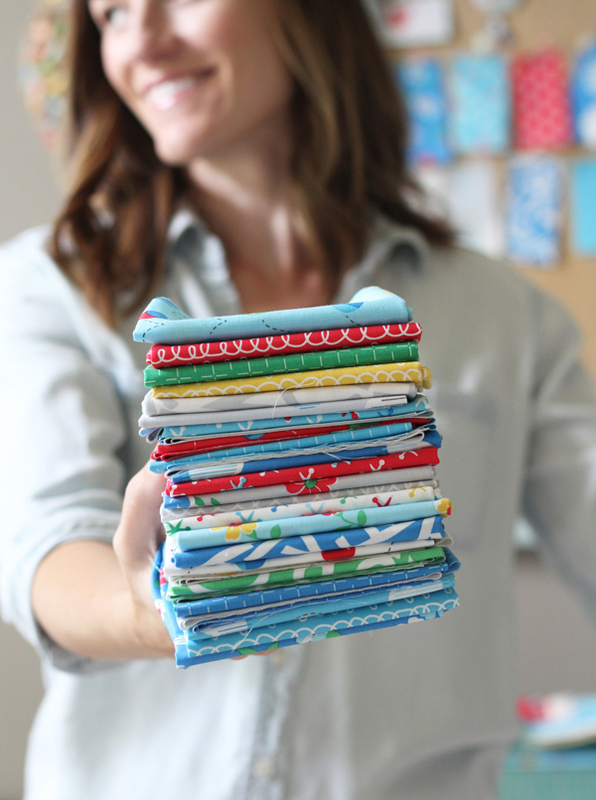 I love all of the projects you’ve made with the fabrics. Congratulations!! You really do have a gift, Allison. I’m in love with this collection! I just LOVE it! Congratulations! What wonderful and fun collection. Can’t wait to see it in person at my LQS. I am loving this fabric collection! It is so fun and playful! Awesome job!!! I love it all! So fun! O.M.G. I am so late to this party but I am THRILLED with this collection!!! I am still hoarding my Dixie and I think I like this one even better!!! Yay I’m glad you like it Anne!